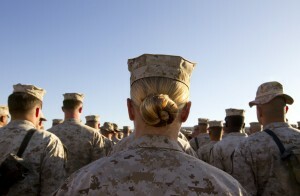 WASHINGTON — Women would be required to register for the military draft under a House committee’s bill that comes just months after the Defense Department lifted all gender-based restrictions on front-line combat units. The 32-30 vote Wednesday night came with a twist: The proposal’s author didn’t back it. Rep. Duncan Hunter, a former Marine who served three combat tours in Iraq and Afghanistan, does not support drafting women into combat and opposes opening infantry and special operations positions to women. Hunter, R-Calif., said he offered the measure during the committee’s consideration of the policy bill to prompt a discussion about how the Pentagon’s decision in December to rescind gender restrictions on military service failed to consider whether the exclusion on drafting women also should be lifted. At times, Hunter evoked graphic images of combat in an apparent attempt to convince colleagues that drafting women would lead to them being sent directly into harm’s way. Rep. Jackie Speier, D-Calif., said she supported Hunter’s measure. “I actually think if we want equality in this country, if we want women to be treated precisely like men are treated and that they should not be discriminated against, we should be willing to support a universal conscription,” she said. Rep. Martha McSally, R-Ariz. and a retired Air Force fighter pilot, said draftees aren’t exclusively sent to the front lines. There are plenty of other useful, noncombat positions for them to fill, she said. Reporters pressed White House spokesman Josh Earnest on whether President Barack Obama would hesitate to sign legislation expanding the draft because it would mean his daughters would be required to register. Earnest declined to comment, citing lawsuits that have been filed against the Selective Service System over the exclusion. If an 18-year-old man does not register with the Selective Service he could lose his eligibility for student financial aid, job training and government jobs. Immigrant men could lose their eligibility for U.S. citizenship. According to the latest annual report, 73 percent of 18-year-olds registered on time during the 2015 fiscal year ending last Sept. 30. And the registration rate for all men aged 20-25 was 94 percent. Hunter’s amendment was part of a defense policy bill that authorizes defense spending for the budget year that begins Oct. 1. The committee passed the legislation by a 60-2 vote early Thursday. The overall bill cuts $18 billion from the wartime operations account to pay for weapons and troops the Pentagon didn’t request, a money-shifting strategy Defense Secretary Ash Carter condemned on Wednesday as a “road to nowhere” that undermines U.S. troops and emboldens America’s enemies. Rep. Mac Thornberry, R-Texas, the committee’s chairman, defended the plan and said the billions of dollars shifted out of the wartime fund would be restored in a supplemental budget submitted to Congress early next year by Obama’s successor. He’s argued the committee’s approach is essential to halting an erosion of combat readiness that has grown worse on Obama’s watch. On another thorny policy issue, Rep. Adam Smith of Washington, the committee’s senior Democrat, offered an amendment that would have barred the Defense Department from financially supporting the ROTC program at any institution that flies the Confederate battle flag. The Citadel is the only school that fits the profile. The college is in South Carolina Rep. John Clyburn’s district. He’s not on the committee, but he backed Smith’s measure in a statement, calling the Confederate flag a symbol of hate, racial oppression, and resistance to the rule of law. Republicans said the college’s Board of Visitors has voted to remove the flag, but South Carolina state law prohibits the Citadel from doing so. The overall bill authorizes $602 billion in defense spending for the fiscal year that begins Oct. 1.